Apps are one of the best ways to connect with your loyal followers and customers. Not only do they look better on a smartphone screen than a mobile version of a website, they can be faster, easier and more convenient to use. Listen in to the podcast or read on to learn 3 reasons why you should consider building an app for your business and compliment your mobile website. I’m going to give you three reasons why you should consider a mobile app for your business. Apps are absolutely essential for business today. I was reading an article just this morning that I couldn’t disagree more. Essentially, it said that we shouldn’t even be wasting our time with apps. However, it’s a $20 billion a year industry and growing. The question is not whether you should have an app or not? The question is if you choose to have an app how will you use it? Why should you use it and who are you using it for? With that said let’s look at the three reasons why you should use an app for your business. Many apps on a smartphone give a better user experience than on your mobile website. That doesn’t mean you should scrap your mobile responsive website and neglect your website’s mobile presentation. Mobile websites are great and they are needed, especially for first-time visitors to our site who are coming on mobile or those who prefer not to use an app. And, your responsive theme will present your content on a phone better than your desktop website. However, there are some things that a mobile website simply can’t do that an app can. First, a mobile website will not allow people to filter content that your audience wants to see. The truth is that the user experiences is deeply tied into what people are looking for based on their interests, needs, problems, or desires. Second, a mobile website isn’t as intuitive or nice looking as an app. If your content is that good and if what you’re providing as a service is that needed, people will want a quick, easy way to get what they want. In fact, many people are starting to ask what a PC or laptop can do that their smartphone can’t. It’s not hard to understand that people are on their smartphones more than they are their laptops or their desktops. One trend in my own habits I’ve noticed is that it is a lot easier for me to grab my phone and login to do something on an app verses getting up and signing into a website on my laptop. Especially with the iPhone’s touch ID feature. I love that convenience!!!!! I can do everything with the touch of my finger and I don’t have to remember all of the unique logins to various sites. It is a very convenient way to do things. Isn’t that part of our responsibility to our customers? Isn’t that part of our responsibility to our customers? Shouldn’t we be creating tools that make it easy and convenient for people to access our content, check a status on something or pay for a service? Isn’t it our job to make the consumption of our products or services easier? The benefit of an app over a mobile website is second to none. An app can allow people to receive notifications based on what they want. A mobile website cannot do that. Here’s what’s really cool… Consider making your app where those who download it login once and then they receive the benefits of the app. Once they login, there could be a feature where they can select what content they want to receive. It could be content around a particular topic that they’re interested in. When an article is created with a particular category that they want information, the app can push a notification on their smartphone alerting them to the new content. It is not intrusive and it alerts them immediately. Because it’s content that they want, they can access it anytime the open the app and see it. An app can push a notification to me in a way that email can’t do. Email has several problems (I’m not suggesting you avoid email, you give people what they want in the way they want it and a lot of people still love to get email notifications and messages). For example, I get 400 or 500 emails a day and I miss stuff all of the time. However, I’m not going to miss a notification on my phone. If I really want something and the app makes it easy and convenient, I’m going to choose the app over a mobile or desktop website. Your consumers may be the same way? I have to admit, I was initially nervous about making payments on my smartphone. After testing out several apps I’ve come to love the quick convenience of mobile payments. I’m a big user of Paypal to create an invoice and receive payments, and then send money to my bank account. Again, I can access PayPal quickly and easily using Touch ID on both my iPad and my iPhone. Within seconds, I’m on my Paypal account. I often create Paypal invoices really fast right on the app. It just feels so much easier and less time consuming than it does on my laptop. 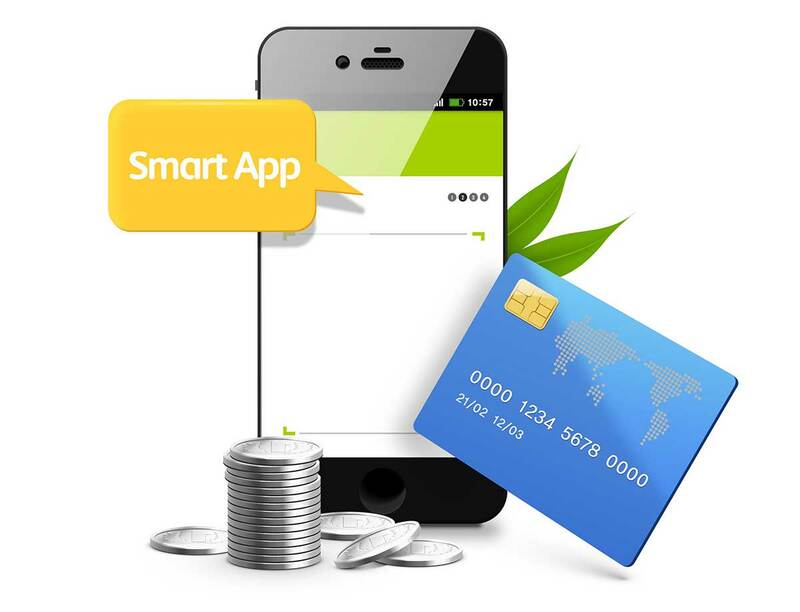 For those who are not used to using an app and you are used to using a website to receive or make payments, you may be thinking to yourself that it doesn’t seem quite right, but it is. App creators and businesses have actually made their apps easier to use than their website. The app is actually faster and easier for me to use and it’s mobile. I’ve got my phone with me 24/7. If you have an e-commerce element to your website, an app can make it easy for your consumers to manage their accounts and for you to receive payments. Personally, I’ve used an app to pay my electric bill. Touch the app on the screen, use touch ID to login, select payment, confirm the bank account I want to debit that I previously entered, and tada… it’s done. I have made my car payment and my credit card payment just as easily. I’ve used my bank’s app to check the status of my bank account. All these apps use the same encryption and safety features as their websites. If your business has a subscription or stuff that people can buy online… it’s easy for them to pay you. There are so many things that you can do with an app that it’s just a wow factor for the people that you are trying to please. Here’s the truth, your raving fans want to hear from you and they want what you have to offer. Why not give it to them in a format that’s really quick and easy for them to use? Today I gave you three ideas of a mobile app can help your business. Apps are not going anywhere. The app industry is still exploding and it’s going to continue to explode. It’s only going to continue to grow. The app forecast by 2020 is $100 billion in revenue. It’s a great time for us to get in on the app marketplace and something that I intend to add in the very near future for my readers, listeners, prospects and clients. What do you think? I would love to know your thoughts or experiences. Please share below in the comments section and let’s discuss it. Previous StorySocial Media – What Impact is it Having on Business?